So, do the results in the previous post apply to this scenario? Because often what is measured in "standard" test conditions does not translate well to real life. 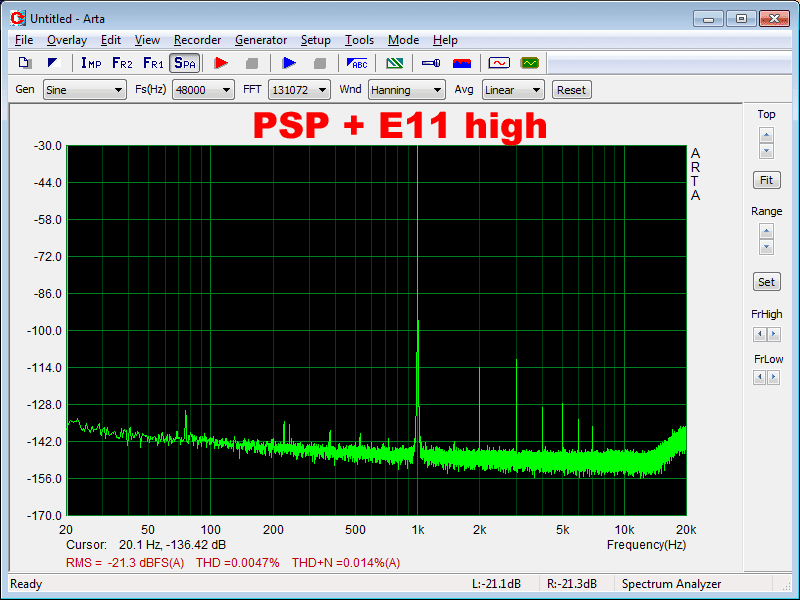 Something with high THD @ 1V, maybe it has awesome THD @ 0.2V? 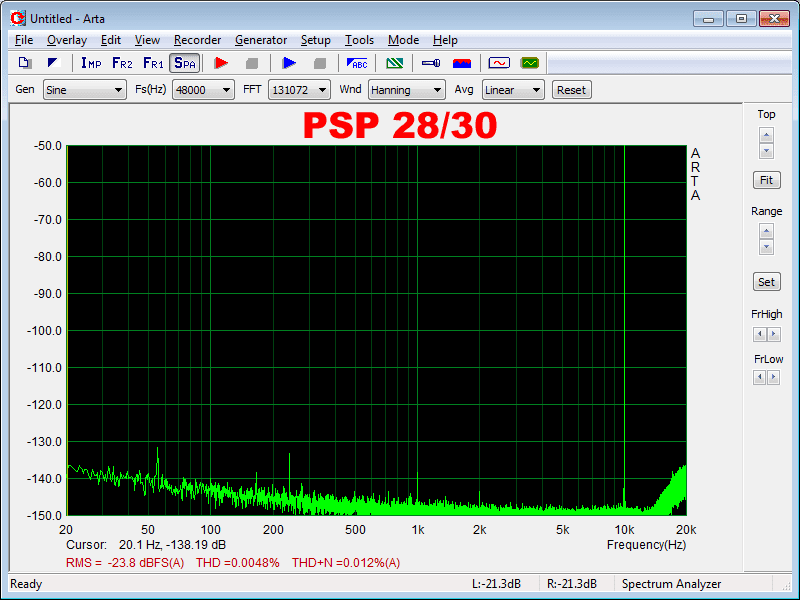 (See also: cMoyBB) Something may have THD @ -90dB, while another has it @ -80dB, but you're going to use it at such a low volume that the noise floor @ -60dB is going to cover up everything anyway. Things like that. So, what do you do to measure measurements that translate translations... sorry, I'm trying too hard. Anyway, to know how your equipment do in real life scenarios, you test them in real life scenarios. There is a common misconception that setting the player to the max volume always produces the best sound quality. This is not always the case, at least where measurements are concerned. 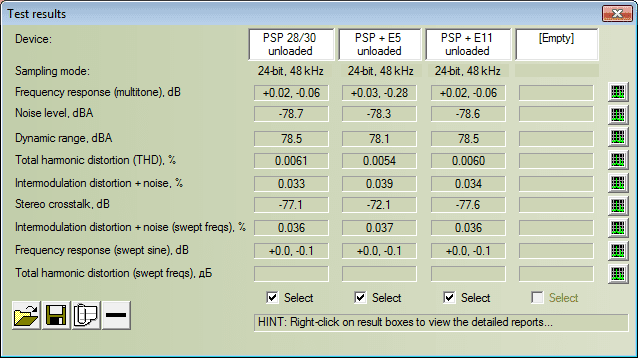 However, many sources/players/sound cards/DACs actually perform worse when outputting a 0dBFS signal, because their amps are being pushed to their limits. And this IMO outweighs the benefits of avoiding digital processing, because the effects of a digital volume control rarely shows up in measurements, but additional distortions from pushing amps to the limits are always measurable. In fact, many years ago, way before I got involved in this audiophilia thing, and probably even before this whole industry of weasels and suckas existed at the small kids/sub-$100 level, I was recording music and I was told to always keep the volume slightly before maximum, but never max. In some cases the output was indeed audibly worse at max volume (for both digital and analogue equipment), and that is not due to overloading of input. Proof? I don't think the burden of proof is on me, because that is pretty much how all THD/THD+N vs output graphs look like. But if you want measurements of cheap sources that are relevant to the context, there are measurements by NwAvGuy. NwAvGuy used a linear horizontal scale so those unacquainted with logarithm may be unable to see it in dB, but usually the lowest THD+N can occur at anywhere between -10dBFS to -1dBFS, more often at -3dB to -6dB range. If it's not clipping from too much current draw from a low-impedance load of course, but in that case you will see the THD dropping then shoot up until the equipment dies, so lowest THD still occurs at slightly below max output. But then, there are also equipment that are okay (little distortion rise) at max volume. In which case there might be unmeasurable harm from digital volume control that can be avoided at a low cost by going max volume. I don't argue against that. If that is the case, I would just measure at 0dBFS. It is easier for the guy measuring to do that, instead of trying to find the volume with lowest distortion and making sure the volume is the same every time. Also, you may argue that it is unfair to not test a source at its max volume, when it is supposed to be able to output that high. My answer is, would you use it at max volume if you know it will be significantly worse? And more importantly, will you/do you need to use it at max volume in the first place? 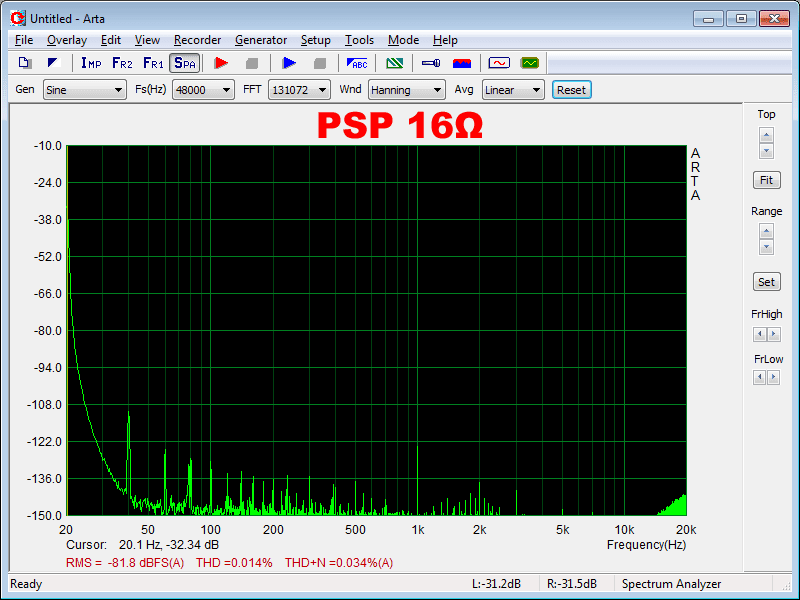 Did you buy an equipment for its performance at 1V, or for its performance at the volume you want? Call me rebellious, but this makes sense to me. slightly below max volume. 4dB lower volume, and 17.6dB lower THD+N. So yup I'm testing the PSP at this volume. I'm going to ignore E11 low, because as mentioned in the Xonar DX Edition, you are getting worse performance to increase the battery life which is very long anyway. This time, E11 is worse than E5, despite being the better one in the Xonar DX Edition. This is because of the 16Ω load vs 33Ω. In NwAvGuy's measurements, E11 gets somewhere between 0.01% and 0.02% THD+N @ 1kHz @ 15Ω @ 0.2V, which somewhat similar to my measurements. Meanwhile, at the 1.7V and 33Ω which I carried out in Xonar Dx Edition, both of us got around 0.003%. Are both sets of measurements (Xonar DX Edition vs PSP Edition) correct? I wouldn't say no, but at the risk of being flamed for inaccuracy I won't say that they are perfectly accurate. But they are at least both correct enough to be useful. And this is why, for measurements to be comparable with each other, the variables need to be controlled. IMO output voltage need not be too exact as long as it is near max and the amp is not clipping, but load impedance can be a major issue. But then again, one can always argue that whatever result obtained in the 1Vrms and 16/33/600/whatever load test does not apply in real-life scenarios. My answer is, big yes. Which is why I tested the PSP Edition - it is closer to my real-life scenario. Of course, nobody knows what your own scenario is like, so the 1Vrms is better than nothing. But I'm starting to think that THD+N vs output power graph @ various loads is actually more important if you are not going to use your equipment at or around the testing conditions, because performance vs output power or load impedance can vary a lot, so much that things like 0.007% vs 0.003% @ 1Vrms 10kΩ doesn't really matter if it is actually 0.02% vs 0.1% @ say 0.2Vrms 16Ω. Interestingly, E5 does fairly well in this scenario, and by "fairly well" I mean "not too sucky compared to the previous scenario". Unloaded, distortions are actually better (but THD+N suffers due to lower output level). Loaded, not too bad either. Horrible bass performance is something that has not changed though. Conclusion is the same as before - marginal, due to bass performance. However, if your setup cannot produce enough bass, you probably won't hear the distortion, and that makes E5 worth considering. Unloaded, E11 is bottlenecked by the PSP's good-but-not-superb performance. Loaded, E11's performance got hit by the 16Ω load and dips, but still somewhat acceptable as everything is below 0.03% for THD and just slightly higher than that value for IMD. Crosstalk needs work though. While E5 wins E11 in everything except bass, the bass alone is enough to choose E11 over E5. 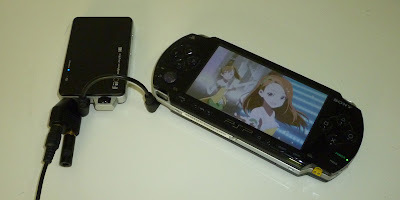 PSP performs rather decently by itself if not for the high output impedance which totally made it unusable with certain headphones. Although nowadays anything can have good measurements. iPhone 4 measures better than some $500 China DAC. Scary? PSP no amp vs E5 vs E11 vs something else? This really depends on your headphone and volume. Impedance over 16Ω? E11 is the clear winner. Your headphones have no bass? You will probably not hear the bad bass performance of E5. 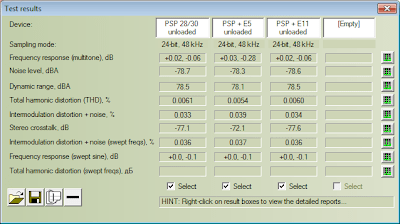 Flat headphone load impedance vs frequency? You might be better off without an amp. Watch out for damping factor though.